The pristine sands, luscious green cliffs and dainty Victorian buildings make it a very enchanting place to visit. The gardens which border the promenade are a tailored masterpiece -the sculpted green areas and carefully attended borders are not to be missed. The town, situated at the top of the cliffs, has a handsome church and is surrounded by good walks. The chalk cliffs are very steep and care should be taken when walking. Fishing is a treasured activity for both locals and tourists. 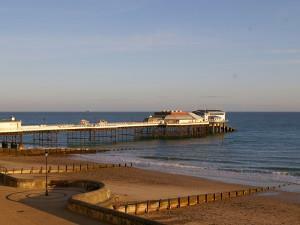 Cromer is famous for the quality of the crabs which have been fished in the area for centuries. Vehicle access is via the A149 and A148. Trains direct to and from Norwich, which is an Inter City train station. Cycle route -Cromer to King's Lynn (quiet lanes in Norfolk project for walkers, cyclists and horseriders.